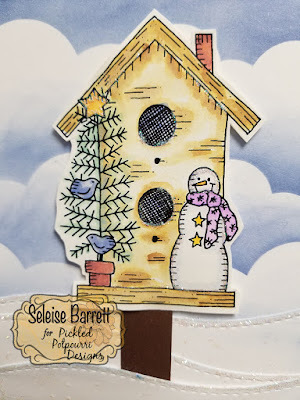 In August I shared a Back to School card made with Seasonal Birdhouses and am back with another image from that cute set! This one is a Christmas birdhouse complete with a snowman, tree and some cute tiny birds. Isn't it adorable!!! For the background, I masked off some clouds with distress ink for the sky and used some die cuts to create snowy layers on the ground. A bit of clear glitter was used on the edges to create the sparkle that snow gets when the sun hits it. Glitter dots were added on the snowy layers by dotting with a glue pen and adding the glitter. I went back and forth about whether I liked the dots but decided to keep them. 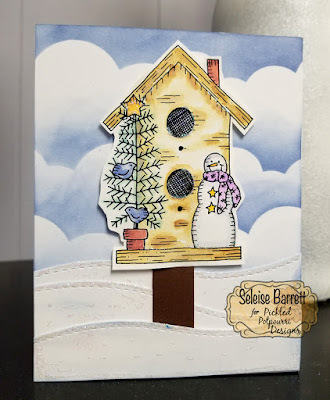 The super cute birdhouse digi was watercolored with distress inks and that was super fun and fast. I cut a strip of cardstock to make a stand and then popped up the birdhouse on top. A bit of glitter was added to the snowman and birdhouse too to continue the sparkly, snowy scene. Isn't that fun! Here's a close-up of the birdhouse. It's was my first time using distress inks for watercoloring but it won't be my last. I loved the blend-ability and the ease of using them to create the shading and layers. This was just on regular cardstock and I wasn't sure how it would take the bit of water and layers but since you barely need any water, it worked just fine. Can't wait to play some more with this technique! Hope you have fun playing with this digi set! It's got lots of possibilities. You could hang this birdhouse from an evergreen bough, you could print different sizes and make a snowy birdhouse village, you could make a shaker card with glitter snow falling all around... you get the idea and that's just with the Christmas birdhouse! There are two other cute designs to play with too! Check out all the great digis at Pickled Potpourri Designs! Have a fabulously, creative day!